C-Line 30 mil PVC card with graphics quality video grade produces premium images for ID badges. The card works perfect with any thermal dye-sublimation printers. It's compatible with top-leading ID printers including Fargo, Zebra, Magicard and Nisca. The CR80 size 3 3/8 x 2 1/8" can be customized accustom to the company. The cards are not punched but can be used in combination of a card holder or with a card holder attachment. Let the employees display their ID with pride the one-of-kind C-Line PVC card today. CR80 size 3 3/8 x 2 1/8"
Size: 3 3/8 x 2 1/8"
Transcript: Welcome to MyBinding.com. These are the Graphics Quality Video Grade PVC ID Cards from C-Line. For high quality, long lasting ID cards, use C-Line’s PVC cards. They work perfectly with any dye-sublimation printers and are compatible with industry leading printers like Fargo, Zebra, Magicard and Nisca. They’re made 3-3/8x2-1/8” and 30mil thickness for strength and little flexibility. These cards are not punched, but can be used with any badge holders or pouches we offer. Let your employees display their ID’s with pride with C-Line. Welcome to MyBinding.com. 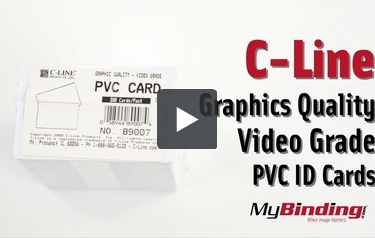 These are the Graphics Quality Video Grade PVC ID Cards from C-Line.